Such a wonderful recipe. One of my husband's favorites. My go-to recipe when apples have been sitting in the crisper for awhile. Also can take advantage of sales since this also freezes well. Sugar not always needed, esp if using a variety of apples. Since I have small crockpots, can make a batch using 3 or 4 apples. Prefer cooking on low for 6 hours rather than on high for 3 hours. Make this most Christmas. Tastes good even after the holidays. I add a variety of dried fruits: cranberries, pineapple, cherries , apricot, figs, prunes, and 3 dates. Generally have a little over 1 pound. This is so easy to make and has great flavor. 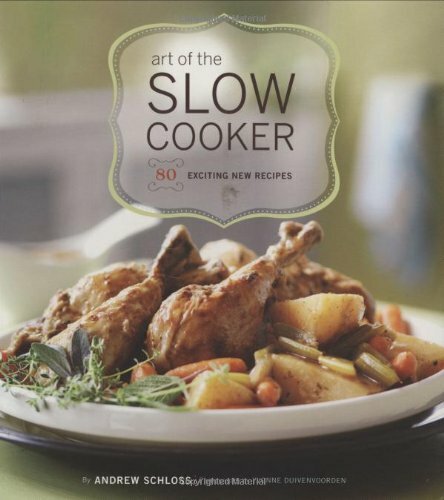 For Art of the Slow Cooker, best-selling author Andrew Schloss has developed 80 recipes for soups, stews, succulent braises, vegetarian dishes, even desserts that bring slow-cooked meals to new heights. Slow cooking gives a wonderful velvety texture to meatloaf, an incredible richness to Osso Buco Milanese, and bold and complex flavors to Curried Vegetables and Dal simmered in Indian spices. Each chapter offers recipes for both simple everyday meals and spectacular dishes perfect for entertaining. With cooking charts to help with timing, advice on finding the right slow cooker for every kitchen, and glorious color photographs throughout, Art of the Slow Cooker will delight readers looking for easy and amazing meals.